In January, I snuck away from the peaks of London skyscrapers to the peaks of the Canadian Rockies for a few weeks. From what I had heard, Vancouver offered everything, from incredible mountains to a bustling city lifestyle and it didn't disappoint. I’ve never been to a city that offers so much diversity through adventure, culture and of course food. To understand the history of Canada you only need to look at their food scene. Vancouver is home to one of the largest Asian communities and the neon lights on Granville Street draw you into an array of old sushi bars and coffee shops. With the beautiful array of fresh pacific seafood on their doorstep, the two cultures go hand in hand and there are over 600 sushi restaurants in Vancouver. Pick up some sushi from Momos and then head to Momiji Gardens in nearby Chinatown, to enjoy it in the tranquil oriental gardens. 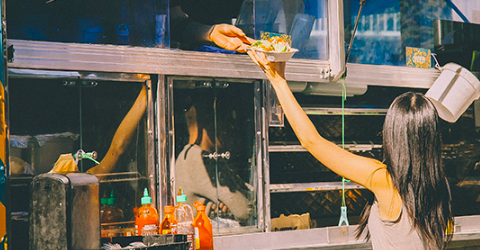 Vancouver is also renowned for its huge array of food trucks. A quick stroll around the city centre and you’ll soon stumble across a street food collective such as the Street Food City Festival. I couldn’t resist a greasy grilled cheese from Melt City, however, I was tempted towards some of the other multi coloured venues like Mr. Arancino and Tacofino who both had queues quickly forming. 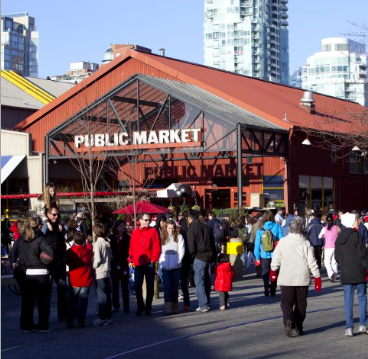 If you’re looking for something to take back home, jump on the bus to Granville Island Food Market. You can spend a couple of hours scouring for tasters of maple syrup, cured meats, seafood, fudge and olive oil all tucked beneath the canopy of an old retro fishing village. A short ferry ride through the misty pine covered islands, you’ll soon arrive on Vancouver Island. Victoria, the original capital of BC doesn’t have much to offer in the day but when the sun goes down and the faint lights of the back streets come on it truly comes alive. Once again seafood is the ‘must have’, If you’re looking for a simple array of shell fish go to Ferris Oyster Bar and Grill. This low key, intimate restaurant was recommended by every local we asked. Shuck at your table, their oysters are intensely fresh, finished with a little lemon. They also have a fantastic selection of baked oysters such as the ‘Rising sun’ togarashi, miso and honey glaze and ‘Downtown’ baked with sage, mushrooms, leeks garlic and butter. Continue the meal with a large bowl of divine garlic white wine mussels to share. To truly experience Vancouver Island, hire a car and drive along the south west coast up to Tofino where you’ll discover beautiful rivers, woodland and lakes, all alongside stunning views over to Port Angeles. End the night with a local ale in the beautiful old British colonial pubs such as Bard and Banker, Victoria and you’ll feel as if you have been transported back to the 19th century! 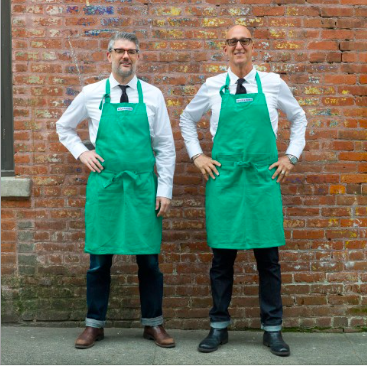 Back in Vancouver, Gastown is the oldest part of the city, sneak a photo next to the famous Steam Clock then explore the numerous coffee shops on every block. On Hastings, you’ll find Meat and Bread, a beautiful, friendly, minimalistic lunch spot with heavenly porchetta, crackling, salsa verde ciabatta sandwiches and cold brew. I was slightly relieved to know that portions in Canada weren’t ‘super-sized’ but we couldn’t resist an over indulgent breakfast at The Jam Café. They are renowned for their adventurous brunch menu which lived up to every expectation. We had the buttermilk fried chicken brioche drizzled with tobacco honey, jalapeño sour cream and scrambled eggs with spinach, pesto, goats cheese on a buttermilk biscuit with ham. To say we rolled out of the café is an understatement! Once you’ve had your city fix, grab a coffee from Revolver on Cambie and take a drive through Stanley Park, across the Lions Gate Bridge and wind along the coast line into the mountains. Having skied my whole life, a part of me is constantly craving to be on the slopes and Whistler has always been a bucket list destination. I was amazed to discover how different the alpine style was in Canada compared to Europe. Amusing ‘groomer’ names such as ‘Jersey Cream bowl’ and ‘Dave’s Day off’ lead you through beautiful off-piste tree lines and into jaw dropping glaciers. Whistler is home to one of the most famous bakery’s in Canada ‘Purebread’, if the smell doesn’t hit you first, mountains of cake, cookies, scones and brownies will draw the eyes in all directions. Sometimes there is nothing better than sitting on a ski lift in pure isolation whilst looking over miles of sheer nothingness tucking into a lavender and earl grey scone. Surprisingly, the underground night life in Whistler Village is infamous, after an evening drinking, pick up a guilty plate of Poutine - chips covered in gravy and cheesy curds. You know it’s good when the cheese curds squeak between your teeth. It's terribly brilliant and 100% a must-eat. The remainder of our trip took us up through Banff and Lake Louise where we immersed ourselves in hiking, ice-hockey, langlaufen and attempting to keep up with the junior US downhill ski team all whilst in awe of the beautiful landscape that surround us. After 3 weeks in the mountains I couldn’t think of anything worse than coming home. Canada breathes a sense of freedom through adventure that is so rare to find and almost impossible to leave behind!